The Battle of Kosovo was a turning point in Ottoman control over the Balkans and a major defeat for the Serbs. As the Muslim Ottoman army moved deep inside Balkan territory, The Serbian ruler Lazar I, with the solid backing of the Serbian Orthodox Christian Church, formed a coalition with other Balkan peoples including Bosnians and Albanians to raise an army that was equivalent in size to the Ottoman forces. Lazar then challenged Sultan Murad I, who, ever eager to take the offensive, met him on the Kosovo battlefield in the summer of 1389 c.e..
Lazar and Murad commanded their troops from the centerlines. Murad’s son Bayezid I led the left flank and his other son, Yacoub, led the right. Lazar’s nephew and the leading feudal Serbian knights led the Serbian cavalry charges. Initially the Serbs gained against the right flank, but Bayezid’s left flank held firm. In the midst of the battle, Miloš Obilic (Milosh Obilich) pretended to be a deserter; he gained access to Murad’s tent and stabbed the sultan. Murad’s guards then killed Obilic. On the battlefield the tide turned in favor of the Ottomans and Lazar was captured. Although fatally wounded, Murad lived long enough to pronounce a death sentence on his enemy, who was then beheaded. Bayezid I was proclaimed the new sultan and to prevent any rival claims to the throne, he promptly had his brother assassinated. Following a custom practiced by many conquerors over the ages, Bayezid I then married Olivera, the daughter of his vanquished foe Lazar. Serbia was formally annexed as part of the Ottoman Empire in 1459. Many Serbian knights, including Bayezid’s new Serbian brother-in-law, fought side by side with the Ottomans in subsequent battles, particularly against Timurlane (Tamerlane). The Battle of Kosovo had a catastrophic impact on Serbia and marked the end of medieval Serbian knighthood. 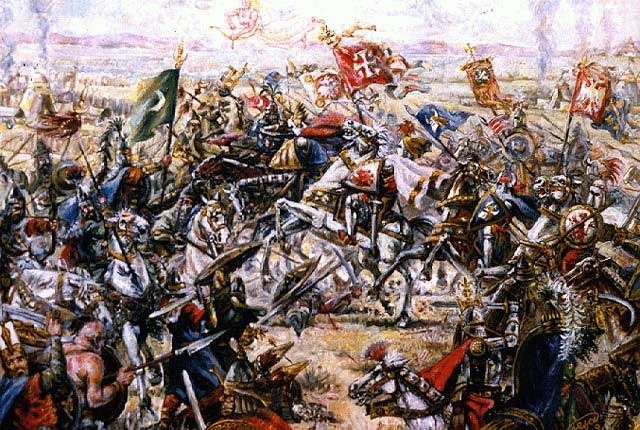 The battle also became a major event in Serbian historiography and numerous folk ballads, known as the Battle of Kosovo cycle, have been passed down through the centuries to the present day. These poems celebrate the Serbian heroes of Kosovo and keep the battle, characterized as the forces of Christianity against Islam and good against evil, very much alive in the popular Serbian national imagination.